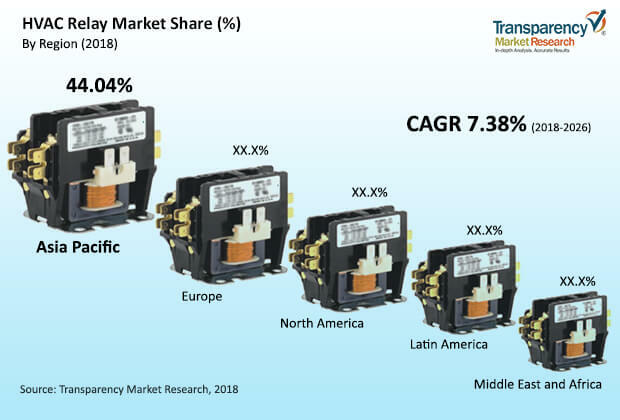 The global HVAC relay market was valued at around US$ 3 Bn in 2017 and is anticipated to expand at a CAGR of more than 7% from 2018 to 2026, according to a new report by Transparency Market Research (TMR) titled ‘HVAC Relay Market - Global Industry Analysis, Size, Share, Growth, Trends, and Forecast, 2018–2026.’ HVAC relays are used to control, and open or close contacts that are attached to the motor. Relay can be described as a type of switch that is usually electromagnetically or electronically controlled to close or open contacts in a different electronic circuit. Relays help control a large voltage circuit with low power signal. HVAC relays are generally used to control the operations of fan motors of condensers, evaporators, motors of cooling towers, and small capacity compressors. Increase in investment in non-residential construction, especially in construction of hotels, hospitals, shopping complexes, and educational institutions, is expected to drive the demand for HVAC relays due to the rise in demand for HVAC systems in these buildings. Rise in demand for indoor air quality management, especially in non-residential buildings, is also anticipated to boost the demand for HVAC relays. Growth in demand from the automotive industry is also likely to be a key driver of the HVAC relay market. HVAC systems have become more of a basic feature of a vehicle in the automotive industry. This is expected to be a key reason for the growth of the HVAC relay market. Demand for passenger vehicles and commercial vehicles has been rising across the globe. This is anticipated to drive the automotive industry and thereby the demand for HVAC relays. The shift toward ‘green buildings’ is also estimated to drive the market due to the implementation of strict regulations and policies regarding energy conservation in buildings. With buildings becoming more energy efficient, the demand for ‘smart’ HVAC systems is poised to increase. This, in turn, is likely to drive the demand for HVAC relays. However, high establishment costs of new and advanced HVAC systems may hamper the HVAC relay market. Upgrade of an existing HVAC system to an advanced one may be a costly affair for some end-users. IOT and production of HVAC relays from environment-friendly materials may provide lucrative opportunities for the HVAC relay market in the near future. With IOT, HVAC systems can perform better and in a smarter way, while environment-friendly materials are expected to boost the usage of relays in green buildings. The HVAC relay market can be segmented based on type and application. In terms of type, the HVAC relay market can be classified into electromagnetic relay, solid state relay, thermal relay, hybrid relay, and others. Electromagnetic relay was the dominant segment with more than 40% share in terms of value in 2017. However, hybrid relay is likely to be the fastest growing segment during the forecast period. Based on application, the HVAC relay market can be divided into automotive, residential, commercial, and industrial. The residential segment dominated the global HVAC relay market with more than 30% share in 2017. This trend is expected to continue during the forecast period. The commercial segment followed the lead of the residential segment during the forecast period. However, the industrial segment is anticipated to expand at a significant pace during the forecast period, primarily due to the expansion in the industrial sector, especially in developing and under-developed countries. This, in turn, is anticipated to drive the demand for HVAC systems and HVAC relays in the application segment. In terms of region, the HVAC relay market can be split into North America, Latin America, Europe, Asia Pacific, and Middle East & Africa. Asia Pacific held the leading share of more than 40% of the global HVAC relay market in 2017. This can be ascribed to the rise in demand for HVAC systems in application segments in the region, as Asia Pacific is also a global leader in the HVAC industry. Moreover, the market in Asia Pacific is expected to expand at a significant pace during the forecast period, primarily due to the rise in demand and production of automobiles in the region along with rise in infrastructure development and per capita disposable income in the region. Key players covered in this report are TE Connectivity Limited, Control & Switchgear Electric Limited, Eaton Corporation, Siemens AG, General Electric, ABB Ltd., Littlefuse Inc., Hitachi Ltd., Mitsubishi Electric Corporation, Rockwell Automation, Inc., Toshiba Corporation, and Schneider Electric.